More than a week ago, I just completed a superhero series Black Lightning and was considering what series to watch. Should I start a new one or continue with other series that I had started before? Then I decided that I want to see something new and this series came to my attention as it was a Sci Fi genre which I have been lacking for the past months. Its plot was about time travel which was 1 of my most favorite story. Well let us see if this series was a good one. Lucy Preston (Abigail Spencer - Chasing Mavericks, Oz the Great and Powerful etc) was a history professor who knew back and forth about the history of the world. Meanwhile Wyatt Logan (Matt Lanter - Pitch Perfect 3, 90210 TV series etc) was a very capable Delta Force soldier. 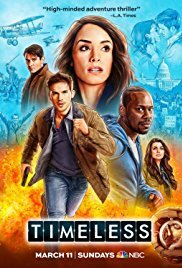 One night both of them were mysteriously called by a Homeland Security agent Christopher (Sakina Jaffrey) to the facility owned by billionaire Connor Mason (Paterson Joseph). Apparently Mason had developed two time machines which 1 of them was stolen by a former NSA agent named Garcia Flynn (Goran Višnjić - Beginners, Extant TV series etc). Lucy and Wyatt were tasked to capture Flynn as he traveled back in time to do his personal vendetta, killing the people in his way and risking the reality in the process. Lucy and Wyatt would be accompanied by the pilot of the other time machine named Rufus (Malcolm Barret - Dear White People etc) who also had a romantic feeling with a programmer in Mason industry named Jiya (Claudia Doumit). The 3 of them would embark in an adventure of cat and mouse to stop Flynn while trying to maintain the history as best as they could. Things were not easy as well since after their first mission, there was a change in reality for Lucy, not to mention Wyatt was also tempted to alter his own history. Flynn proved to be a very difficult adversary and he was able to shake Lucy's confidence with the information of mysterious Rittenhouse. So how would the story unfold? Could they all stop Flynn's plan and find out about Rittenhouse? Find them all in this fun exciting series. Now this series started very interestingly. The pilot episode was fun, intriguing and full of excitement. The 3 characters were very amusing, especially the persistence of Lucy to maintain the history as she knew it which was the total opposite of Wyatt's mission to stop Flynn without considering the history/future. Rufus' kind character was also nice to see as he was sometimes put in the middle of these 2, and his awkward relationship with Jiya. These 3 lead characters were definitely the main attraction of the series. Another funny thing about these three were the names they used when they went back in time which sometimes were very hilarious (my favorite was the name Rufus used in episode 6). About the time travel itself, it was pretty standard. I even felt it was not the most logical time travel event (although you got to admit time travel itself was a rather unchartered area as no one actually knew how it would be affected anyway). But the one thing that made me feel rather difficult to accept was the fact that whenever they returned from a time travel trip, they would return to a later time, rather than to the time they left. This part I think was not too realistic, as they should be able to return to the exact time as if they never left. I think DC's Legends of Tomorrow TV series was more logical in this area. Apart from that, I think the time travel thing was still quite believable. Special effects of this series was quite decent. The best thing about going back in time were the costumes and set which were pretty nice. It seemed quite realistic, especially the 1920s, 1950s or 1980s era. Another interesting part would be which period or year they would return in time because it was very intriguing what kind of history they would alter. And throughout 16 episodes, they varied not only from the history of US but also other locations. Talking about the episodes, the one thing that bothered me was the season finale. I do not know why but it felt rushed to be completed in that episode. Not to mention the finishing felt rather forced and a little bit disappointing. From what I read in the internet, the series was originally cancelled after 1st season but then continued for another season. Which otherwise would have sucked with that kind of ending. The series also had quite a number of recurring characters such as the pilot abducted by Flynn named Anthony (Matt Frewer - Orphan Black TV series), Lucy's mother Carol Preston (Susanna Thompson - Dragonfly, Arrow TV series etc) or the mysterious guy with Rittenhouse background (John Getz - Jobs, Trumbo etc). And because the series was co-created by Shawn Ryan & Eric Kripke (the special man who created Supernatural TV series), there were also the performance of Misha Collins and Jim Beaver in some episodes (you would know who they were if you are also fan of that series). Overall I think this series was a quite fun time travel series. Some of the time travel aspects were OK but not the best one. It stood out differently from the other time travel stories due to its main characters were really fun and had good chemistry. Plus there was the mysterious element which was intriguing and unfolded nicely, even if the finale & the solution was a bit rushed (one cannot be blamed for thinking it was too easily resolved). So if you are looking for a fun time travel series without too much complication of the time travel element, I think this one definitely could be given a try. I myself pretty enjoyed it and definitely would still watch the second season to see how things develop for all the characters.